While Apple and Google are making a push into the automobile with CarPlay and Android Auto, they both require use the center dashboard as the main display. Navdy wants you to keep an eye on the road at all times and while doing so, see exactly where you’re going. 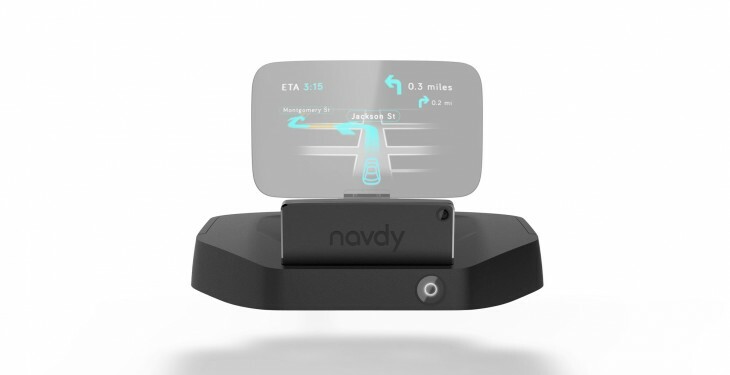 The Navdy HUD (Heads Up Display) system sits on your dashboard between your steering wheel and the windshield with a display that projects an image that appears to float six feet in front of the windshield. The projected display connects to your iPhone or Android phone via your favorite apps like Google Maps to help you navigate around town without looking down at a phone or over at a center console. It is also controlled via gestures so even when you do get a call, you’re not fumbling for your phone. Just give a thumbs up above the steering wheel to answer and swipe to hang up. You will be notified of who’s calling on the display alongside your directions. Voice control can be used to take care of text messages. This means messages can be read aloud to you while you’re driving, so you’re not reading them when you should be merging lanes. I was able to demo an early prototype of the system. While I was concerned about road vibration but it never seemed to be a problem on San Francisco’s nearly-always-under-construction streets. The display at the time wasn’t tuned to six in front of the windshield yet, instead it ended in the center of the hood. But on an atypical bright and sunny summer afternoon in the city, the display was crisp and clear, which is vitally important for HUD. If it’s difficult to read, not only is it frustrating, it’s unsafe and Navdy is all about safety. “By putting the information floating in front of the car, all the information is in focus at the same time,” Doug Simpson, CEO of Navdy told TNW. The system uses a runner mount that conforms to the hump above your car’s console behind your steering wheel. The unit attaches to that display so you can use one unit in multiple vehicles. It’s powered by the car’s ODB II port (required in all cars 1996 and later) which gives it the added bonus of sharing RPMs and speed with the unit. It connects to iOS and Android devices via Bluetooth, and also to Google Maps and other navigation apps, you can use it with Pandora, Spotify and other music streaming apps. Navdy is offering a 30 day pre-order campaign discount of $299. The final price will be $499. The team is hoping to hit $60,000 through these initial pre-orders. It’s crowdfunding the device one its own without Kickstarter or Indigogo. But, unlike some crowdfunded items that seem more like pie-in-the-sky ideas that will probably never make to market, I’ve seen a prototype of the Navdy in action. If you drive a lot it’s worth a look — no one wants to explain that they ran into a pole because they were trying to check their text messages.